A short while ago my wife and I made an appointment to meet with the Executive Director and Curator of the Capital Art Collection. No, that is not an investment fund! 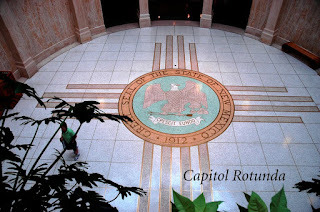 The capitol building of the State of New Mexico has a collection and a serious arts program. The capitol of New Mexico is Santa Fe and the capitol building is hidden behind trees on the border of the most historic part of town. The circular building with four entrance wings protruding to the North, South, East and West was designed so that from a bird’s eye view it resembles the sun symbol of the Zia tribe. Their pueblo is located in Northern New Mexico. The Zia symbol was adopted for the state flag when New Mexico achieved statehood in 1912. The “new capitol”, also known as the Roundhouse, was dedicated in 1966 and required asbestos remediation between 1989 and 1991. There was already a system in place similar to 1% for art and at the time of the necessary renovations the legislature decided to set up the Capitol Art Foundation with a panel of 25 arts experts from around the state including curators, directors and scholars. It was agreed that the foundation could not buy art but could only accept it as a loan or by donation. The money appropriated would go only for the salary of the sole director/curator and pay for installation of the art acquired. Today the collection numbers over 600 works in all areas including paintings, drawings, sculpture, ceramics, textiles, photographs, prints and mixed media. Aside from judgments of quality, the only prerequisites for donations are that the artists are from New Mexico or work here. 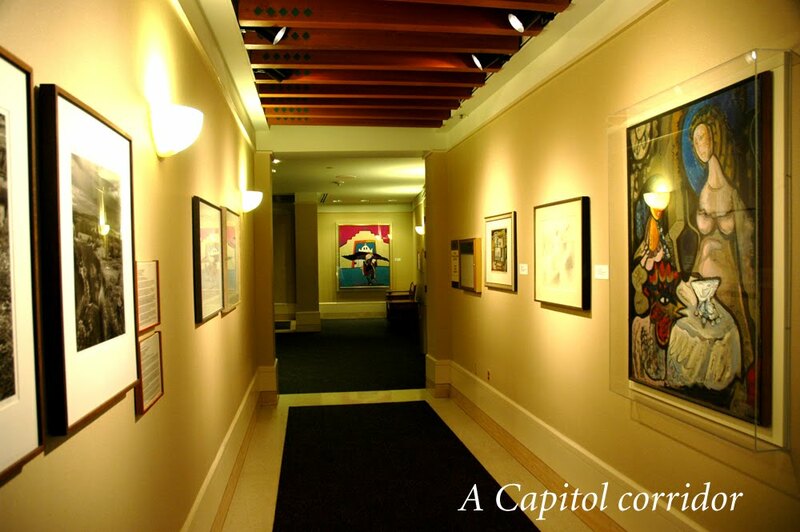 The works of art are installed throughout the four floors of the Capitol down every corridor and on every wall. 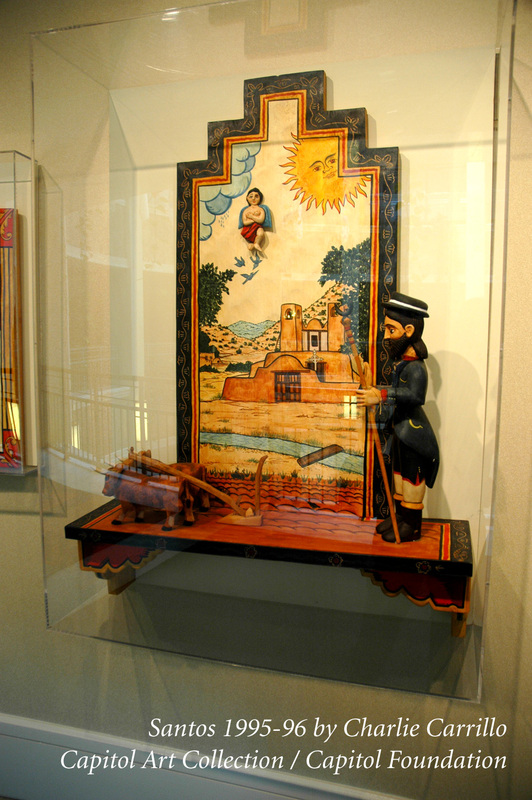 All the cultures of New Mexico are represented including, Hispanic, Native American and Anglo. The most popular piece in the collection is a monumental mixed media Buffalo Head lent by the artist, Holly Hughes. Additionally, two temporary exhibitions are organized every year, (before budget cuts there were four). 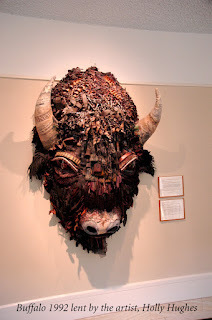 When we visited we saw “Roots and Vision of the African American Experience in New Mexico” consisting of work by 25 African-American Artists from Albuquerque. The next exhibition which will open in September will be art created by public school students throughout the state. It is ironic in that in the most recent budget cuts, art is being eliminated from the curriculum. The Executive Director and curator who does all this on her own is Cynthia Sanchez, who was appointed shortly after the Foundation was set up. She has degrees not only in art history but also in painting, sculpture and performance studies. All of them must come in handy in juggling what she has taken on, not to mention the politics of dealing with the legislature. 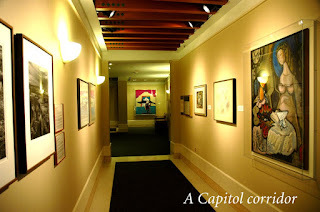 Interestingly, in the same building, the Governor has his own Governor’s Gallery in his offices. It is a separate entity, with its own curator, who organizes loan shows…. but that is for a later Missive.